NEW YORK (AP) - He was America's missing child, the little boy who went off to school alone and vanished. 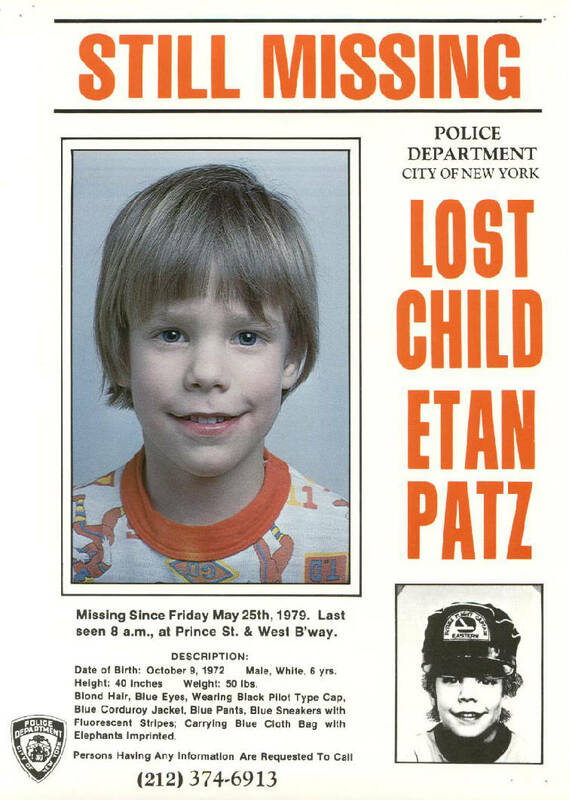 A renewed investigation into the 1979 disappearance of 6-year-old Etan Patz in New York City recalled the years when printed images of missing children appeared on milk cartons. On Thursday, investigators began searching a basement in Manhattan for human remains of the boy. Etan's disappearance on May 25, 1979, drew national attention to child safety, ushered in a generation of parents who became afraid to send their kids out alone and helped fuel a movement to publicize missing children's cases. President Ronald Reagan declared the day of the boy's disappearance National Missing Children's Day. "The story really resonated and touched millions of moms and dads," said Ernie Allen, the president of the National Center for Exploited and Missing Children, which helped push the national milk carton campaign with Etan's image. And Etan's image on milk cartons, the missing boy shown with thick blond locks and goofy grin, caught the public's imagination like no other. "Etan's photo became almost iconic," Allen said. While Patz's face was among the first to appear on thousands of cartons across the country, the practice began with local dairies in the Midwest. "What it did was raise the level of awareness," said Noreen Gosch, whose missing son, Johnny, was among the first to have his face appear on a milk carton. "It didn't necessarily bring us tips or leads we could actually use." Her son, who disappeared on his newspaper route in West Des Moines, Iowa, in 1982, has never been found. His image appeared on milk cartons probably in 1983, Gosch said. The milk carton campaigns faded away beginning in the late 1980s after pediatricians, including Dr. Benjamin Spock, criticized the images for inducing unwarranted fear in children as they ate breakfast. Patz vanished after leaving his family's SoHo apartment for a short walk to catch a school bus. It was the first time his parents had let him go off to school alone. "It was a case of enormous attention," said police spokesman Paul Browne on Thursday. "It was something we hadn't seen since the Lindbergh kidnapping" - referring to the 1932 abduction of aviator Charles Lindbergh's 20-month-old baby boy. Browne said a forensic team planned to dig up the concrete floor of the Manhattan basement and remove drywall partitions in an attempt to find blood, clothing or human remains in the building, just down the street from Etan's home. The work was expected to take up to five days. FBI and police officials didn't publicly announce what led them to the site, but a law enforcement official told The Associated Press that investigators made the decision to dig after an FBI dog detected the scent of human remains at the building over the past few weeks. FBI spokesman Tim Flannelly said it was "one lead of many." "We're out here 33 years after his disappearance, and we're not going to stop," he said. Investigators have long eyed the basement with curiosity because it can be accessed from the street on the boy's route to school. At the time, the space was being used as a workshop by a neighborhood handyman who was thought to have been friendly with Etan. FBI investigators have interviewed the man several times over the years. Investigators questioned him again recently, and as a result of those discussions decided to refocus their attention on the building, according to the law enforcement official. The official spoke to the AP on condition of anonymity because the investigation is ongoing. Two other law enforcement officials also confirmed that an FBI dog had indicated the scent of human remains in the space. Etan's parents, Stanley and Julie Patz, became outspoken advocates for missing children. For years, they refused to change their phone number, in the hope that Etan was alive somewhere, and might call. They never moved, although they obtained a court order in 2001 declaring the boy dead. Stanley Patz didn't respond to phone calls and email messages Thursday. A man who answered the buzzer at the family's apartment said they wouldn't be speaking to the media. No one has ever been prosecuted for Etan's disappearance, but Stanley Patz sued an incarcerated drifter and admitted child-molester, Jose Ramos, who had been dating Etan's baby sitter around the time he disappeared. Ramos, who is not the carpenter whose workspace was being searched, denied killing the child, but in 2004 a Manhattan civil judge ruled him to be responsible for the death, largely due to his refusal to contest the case. Ramos is scheduled to be released from prison in Pennsylvania in November, when he finishes serving most of a 20-year-sentence for abusing an 8-year-old boy. His pending freedom is one of the factors that has given new urgency to the case. Investigators have looked at a long list of possible suspects over the years, and have excavated in other places before without success. The 13-foot by 62-foot basement space being searched Thursday sits beneath several clothing boutiques. Investigators began by removing drywall partitions so they could get to brick walls that were exposed back in 1979 when the boy disappeared, Browne said. Browne said the excavation is part of a review of the case, which was reopened by the Manhattan district attorney two years ago. "This was a shocking case at the time and it hasn't been resolved," Browne said. The law enforcement activity forced the temporary closure of some businesses on the block, including the fashion boutique Wink, on the ground floor of the excavated building. "It's insignificant," owner Stephen Werther said of the lost business. "It's retail. There's always another day for us to make a living. This may be the family's last chance to find out what happened to their son."